The more time I spend looking at trends on social media and how they translate into my community, the more I notice the differences between how most models and model photographers use social media in general. Many models seem to gravitate naturally toward the social aspects of social media. Model photographers, on the other hand, seem to struggle a bit more with putting themselves out there on social media. I’m writing this article to help model photographers who are struggling to get started on improving their social media presence. First things first. You have to stop letting comparisons to others (models specifically) stop you from moving forward with your social media plan. If you stay hung up on that, you’re not going to be able to move forward. If this isn’t a problem for you, that’s great! I’m only bringing it up here because it’s a common problem I’ve seen and I feel it needs to be addressed. Social media growth is all about growing your fanbase, your followers, and hopefully your customers (and possibly collaborators). This means what you need to focus on how your numbers increase with the things you do. I only want you to look to others for inspirations and ideas, not for negative comparisons. So from this point on stay focused on developing your plan and you will start seeing results. This is called adding value to posts and it’s an important part of social media. I’m going to share more about how you can do that in just a moment. Before we do though, let’s take a moment to talk about platforms. 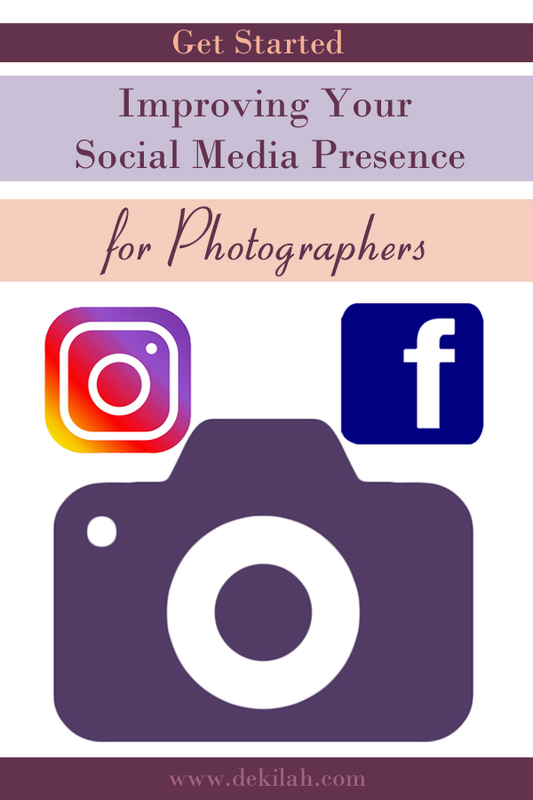 As a photographer there are two platforms you’ll probably find most useful: Instagram and Facebook. Facebook has become more and more difficult to use, but Instagram is a thriving, growing place that is perfect for photographers. I suggest using both a Facebook fan page and an Instagram account. There will be differences in how you use them, but you can still use much of the same content. Having a Facebook page will also allow you to create ads on both Facebook and Instagram which you may find useful later. It also allows you to view your stats on Instagram if you choose to switch to a business account there. Now that we’ve established where you should be (at minimum), we can move on to the added value I mentioned earlier. Let’s talk about some simple ways you can add value to your posts within the text of the post. These tips should also help you plan what to post as well. Share details about how you got the shot, especially if it’s something different or interesting. Just remember to keep them easy to understand. Assume your followers are non-technical. You can always elaborate later if asked. If there was a funny or interesting story behind the shot, share it. It could be about how you met the model, something that happened during the shoot, etc. You can also share a couple sentences about your concept and what inspired it. What you’re doing is adding something extra to your post. Keep your followers reading and interested in the story that your art creates. Don’t get hung up on the idea that your art should speak for itself. Maybe it does, but it doesn’t hurt to offer something extra. That’s what keeps people coming back because people are curious to know what’s below the surface of what they see. Take a few minutes now to look at some past posts (or planned posts) and brainstorm some added value text to add to them. You might even find that you can repost those things with your new text and get more interaction. Now that we’ve started you off with a good foundation to start moving forward, let’s talk about how you can keep learning. I’m going to let you in on something else you need to do: keep learning about how to use social media! There are tons of free and affordable courses out there that you can learn from. And if you find you’re still struggling and would like some one on one help in coming up with how to add value to your own posts, get in touch with me to discuss an affordable mini consultation session. I’d be happy to help guide you through a few examples using your photos.